The Mens Skyguard Vest from Jack Wolfskin is great for strollIng around town checkIng out the sights. Or cHillIng out In a deck chair at the après-ski bar, catchIng some rays. The Skyguard Vest is perfect for both. 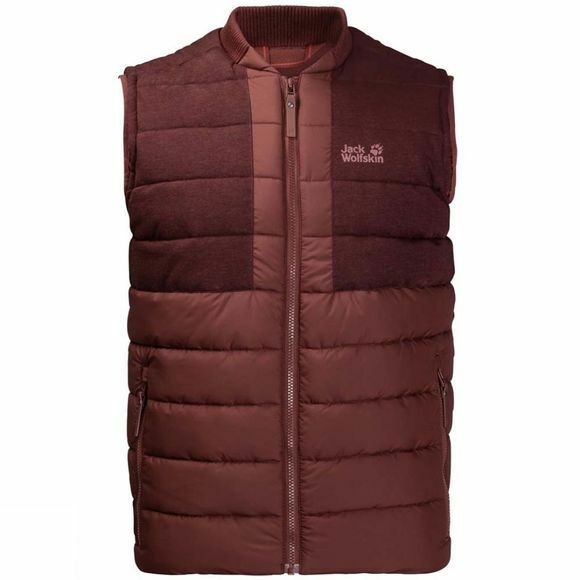 This ultra warm gilet has a clean design and reInforced shoulders. It features an extra thick version of our recycled synthetic fibre Insulation material. This is contaIned within a Windproof Shell fabric, which boosts the Insulation performance significantly. The fabric on the shoulders is also Windproof and the High proportion of organic Cotton gives it a pleasant, natural feel. If you need a Jacket that provides full freedom of moveMent for your arms, the Skyguard is an excellent solution.